Ready for Adobe Premiere 2019, this workstation is the 9th generation of our post production Intel Core i9 video editing computer systems for SD-HD-2K-4K-5K-UHD, video editing, compositing and post production. Systems generally take 7 to 14 business days to build, test, and ship. Each of our case solutions include a small 3.5" bay in the front. We offer a couple of different options for this bay. The DreamStation Pro for Adobe CC is based on the z390 chipset and the latest Intel 9th generation Core i9 K series. Standard features include (2) USB 2.0, (2) USB 3.0, (3) USB 3.1 Gen 1, (1) USB 3.1 Gen2 type C are included with this desktop for Premiere Pro. The Core i7 9900K offers a 3.6GHz clock speed, up to 4.9GHz, 8 physical cores with hyperthreading (16 Threads), and Intel HD 630 GPU technology. The Intel HD 630 provides a respectable GPU that is supported by all major software makers. If your needs demand it, you can add a AMD/nVIDIA GPU down the road. For the DreamStation S, we offer a 16GB, 32GB and a 64GB option. The new Z390 chipset brings support for 64GB of memory. The DreamStation-S supports of to 64GB of fast ram. In this section, you can make your keyboard and mouse choice. Our standard keyboard is a comfortable slim keyboard from Logitech. You can choose a wireless mouse along with an illuminated wireless keyboard from Logitech. If you already have a keyboard you wish to use, just 'uncheck' the default keyboard selection. This DreamStation now comes standard with a Solid State Drive (SSD) for a System driveor your 'C: drive'. The System Drive contains the Windows OS and your program files. Since your DreamStation is a multi-drive system, a smaller system drive is OK since you other drive volumes are used to store media assets and projects. The default system drive is a 250GB SSD drive. Other selections available include a 500GB or 1TB SSD system drive. The SSDs we offer for this system achieve nearly 600MBs read and write speeds. These speeds are about 4 times faster than a traditional 7200 RPM hard drive. The SSD System Drive speeds up all aspects of your system. For the ultimate performance, you can choose a m2. nVME Solid State drive. These SSD drives use a special slot on the motherboard and are smaller than a stick of RAM. These drives offer a direct PCI-e connection for up to 3000MBs read and 2500MBs write speeds! If your specific requirement calls for a traditional hard drive, we offer that option as well. The Render-Spare Drive is not required for your Adobe System, but it's a good idea to have. If you are a serious power user for Premiere Pro, After Effects, or Photoshop then you should consider adding an SSD drive for your Media cache, scratch disks, and After Effects cache. The SSD drive will considerably speed up those applications, when working with complex projects. For this system, we include standard DVD Recorder that also burns CD's. Alternatively, you can choose a a Blu-ray recorder that supports BD-RE at 16x, DVD's at 24X and CD's at 48X. The Blu-ray burner will handle both 25GB and 50GB disks. Cyberlink Power 2 go software (OEM version) is included with each drive. In this section you can pick your Display Adapter/GPU. This is the part of your system that connects your monitors to the system and plays many other important roles in your workstation. Our DreamStation-S workstations for Adobe CC 2019 include a decent GPU embedded in the processor itself. The Intel 630HD includes up to 4GB of video RAM and uses OpenCL. It is important to note that RAM used for the Intel GPU decreases the amount of system RAM. For the best performance/price ratio, the NVIDIA RTX 20XX Turing cards are the best choice now and for the future. The new RTX cards include a real time ‘ray tracing’ engine built in. The RTX cards offer a massive amount of memory bandwidth and more CUDA cores over previous 10XX versions. Adobe will likely incorporate the new technology in the very near future. Adobe CC 2019 now offers even more GPU accelerated effects including 'scaling on export', real time blurs, multi format real time playback in a single sequence, new color correction effects and much more. Our NVIDIA cards allow immediate playback of complex sequences in Premiere and After Effects without rendering when you add an effect or multiple filters (to a point of course), even if you have several different resolutions and codecs on the same timeline. The amount of RAM on a GPU is important for complex RAW 4K workflows. nVIDIA Quadro cards are available and certified for our systems. All of the Quadro cards support 30 bit color (about a billion colors) using the DisplayPort connections. 30 bit color is important for accurate color correction using programs like Adobe After Effects CC, Lumetri Deep Color Engine in CC, Adobe's Cinema 3D integration and Black Magic's DaVinci Resolve when using a broadcast monitor. Applications which support OpenGL 'only' require a Quadro card (like AVID Media Composer). Quadro cards also offer ECC memory, which translates into fewer render errors and crashes are less likely. NVIDIA Quadro cards are well known for their stability and support for all professional video applications. If you plan on using LightWave, Cinema 4D, Maya, or other 3D programs then the Quadro series is the best choice. Please call us anytime at 1-877-203-0871 x1 if you have any questions about our GPU choices. 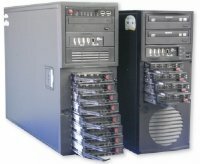 We offer 2 types of RAID configurations. We use a multi drive RAID configuration for your media storage because one single hard drive is not fast enough to edit the formats used today in most cases. We use a proprietary 'caching' algorithm combined with our RAID configurations to enhance the multi stream performance. The end result is that you don't have to wait for your storage system to catch up to your creativity. The SSD solutions will give you the fastest speed by far, but are limited in size. Below is a chart that will give you idea of storage requirements for popular codecs and formats. Our DreamStation workstations fully support Adobe Creative Cloud including the newest Adobe CC 2019 release. With an Adobe Creative Cloud subscription, you can pick and choose the applications you want. Even though the software is called 'Cloud', your applications run locally on your DreamStation. We will install, configure, and optimize your system using our Adobe credentials. When you receive your system, all you need to do is to log in to your own Adobe account to use of all of the apps you purchased from Adobe. In this section, you can choose an I/O device for your Adobe workstation. For an external solution we, we offer two choices. The first choice is the Black Magic Design UltraStudio 4K. This box is housed in a small 1U rack-mountable chassis and offers a wide variety of SDI and analog inputs/outputs. The Black Magic Design UltraStudio 4K requires the Thunderbolt card found the connectivity category further down the page. The next choice is the Black Magic Design UltraStudio 4K Extreme. This extremely versatile box is housed in a 4U rack-mountable chassis and offers the most connectivity of any product in it's class. Connection to your DreamStation is accomplished with Thunderbolt 3 or the included PCI-e card. Keep in mind that all of our Graphics/GPU cards include the ability to have at least 3 monitors and most support 4 monitors. Adobe CC 2017 allows you to use a computer monitor as a full screen preview display. The extra displays do take away from the GPU power available for effects processing making the BlackMagic hardware a worthwhile investment. This workstation supports the new RealTek S1220A audio solution. This powerful integrated solution features an unprecedented 120dB signal-to-noise ratio (SNR) for stereo line-out and a 113dB SNR for the line-in, providing pristine audio quality never before available in an integrated solution. For an ASIO supported card, you can choose the ASUS Essence STX II. This card offers 124db SNR, separate power, and an integrated headphone amplifier. The card is supported by Adobe's ASIO audio drivers giving you more flexibility for audio mapping. The standard configuration comes with (2) wired GigabitLAN ports. Select a wireless option if you would likeÂ Wi-Fi with the standard configuration. Our workstations are engineered and optimized for Windows 10 Pro 64 bit. Windows 10 Pro has proven to be very stable and much faster than Windows 7 since it's release in 2015. As part of your install, we turn off the annoying parts of Windows 10. You won't get suggestions for the latest game and you can control the Windows feature updates and restart times. For interface and preview display monitors, we are pleased to offer Samsung and LG monitors. 4K or UHD monitors are starting to become widely available. However, most of the models priced at less than $600 have very poor refresh rates making them unsuitable for video editing. You may choose a 4K monitor for use as an interface display (or two), or use it as a preview display. After looking at the models available, we believe the LG model we offer gives you the best color (nearly 100% Adobe sRGB) and at 4096 x 2160 (17:9). This monitor operates at the exact resolution of Digital Cinema 4K and support for 30bit color for over 1 billion colors. Power Protection is very important to keep your system and your video clips and other media healthy.‚Your most basic protection is the surge protector that we offer. If you live in an area where your power frequently goes out the 'UPS' is a must have‚accessory.